It doesn’t matter if you play Blackjack online or in the land-based casino, if you want to beat the house – you should definitely learn the blackjack strategies, as they do fairly increase your winning chances. But before getting started with learning the strategies get acquainted with the basics and rules of the game, if you’re completely new to it. Also, if you’re not willing for some reason to play for real money – find some free games on the internet in order to practice. These blackjack strategies aren’t just some random advices out of nowhere. These are mathematically calculated schemes, which are proved in practice and they realy teach you how to win at blackjack. Basic strategy is suitable for beginners. 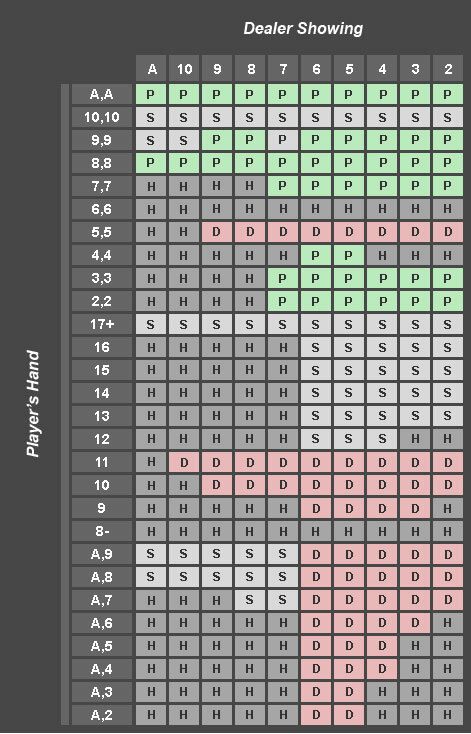 And if you memorize this chart, to start playing will be much easier for you. 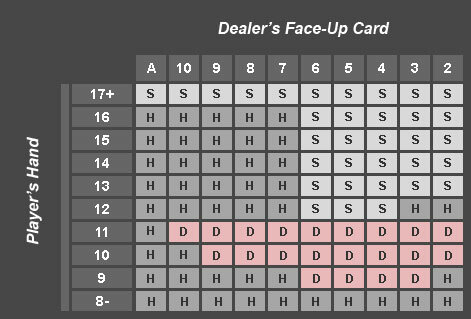 The golden rule of the basic strategy is – If your hand (cards in total) is 8 or less, you hit till you reach 17! If you feel like you’ve already practiced the basic strategy enough and ready for the next level, you may consider to go with the “intermediate” strategy, which is a little bit more complicated, but it gives you even more chances in winning. Advanced strategy implies card counting. Of course this isn’t the easiest thing to do, especially if to take into consideration that if you’re planning to play in the land-based casino you have to be very careful, as counting itself may not be illegal, but if you’re busted by the casino security – you probably won’t be able to enter this casino ever again. © 2018 Blackjack Online Trainer - Gambling & casino information. All rights reserved.